Using spots and stripes in your home may not be something you automatically gel with, I certainly didn’t; in fact spots and stripes had to work pretty hard to win me over. When it comes to spots and stripes it’s all about finding the right balance; for spots I think it’s about avoiding that twee and cutesy look, and for stripes finding a style that isn’t too traditional or beachy. I’ve found a few ideas of stylish spots and stripes that can be a great way to give a home a touch of the fun, patterned effect. For me, when I think of stripes in the home I immediately think of Roger Oates and their fabulous stair runners, which in fact was major part in changing my opinion on stripes. The Fitzroy runner is smart, sleek and contemporary. The stripes bounce of the stark white stairs and walls, giving it a really punchy effect, it’s a great feature to see when you first walk in the door, showing off a relaxed but sophisticated sense of style. If you don’t want to use stripes in such a dramatic way, this mirror from Barker & Stonehouse is an interesting twist on the pattern. With strips of mirror formed into one large piece, it gives a subtly to the motif, whilst still creating an intriguing design. I love this spotted pattern by Marimekko, the dots squished together on rows is a simple design, but really gives the tableware a fun character, the jug is a great one-off piece in the collection to buy if you want a stand out item on your table. These Louis Poulsen pendants bring just the right amount of a coastal vibe, with a shell-like shape and beach tones, but with a sophisticated and contemporary design. They’ll hang elegantly alone or in a group, the three colourways could be mixed over a kitchen island unit for an eye-catching feature. Although polka dots in interiors aren’t something I would necessarily put in an interior, I’m a little smitten with the Polka Square wallpaper design by Farrow & Ball. It’s a delicate style that would look really sweet in a kid’s room or hallway. Sticking to wallpapers, this wavy stripe by Elitis, is a modern and fun way to make a strong statement in a room. Its design can hold its own style wise, but would work as a backdrop for your furniture as well. Margo Selby always has some beautiful designs, with just the right amount of colour, texture and retro design to give you a fresh look. I love this throw with its geometric circular pattern, it would make a great accent of colour in a living room. For a smaller addition of a few spots to your home, this little ceramic salt pot has an abstract spotted design that’ll look great on your dining room table, or next to your hob among the spices. To keep stripes to more of a traditional form, William Yeoward has some classic designs. This stool has beautiful pink and cream stripes, and the curved wooden legs and the bouncing seat pads gives it an extra spark of personality. Finally, I had to pop in this sweet cushion from Houseology, the colourful stripes have begun to run like water colours, giving the cushion a softer look. 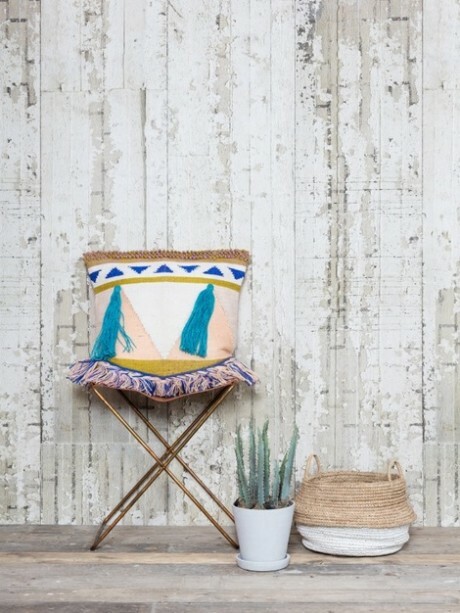 A quick and easy way to add stripes while giving a chair a splash of colour. A spot and a stripe here and there in your home is a great way to add character and break up a space, while offering an alternative pattern and design to a room to keep it looking fresh. Whether you want to stick to traditional styles, or test out some more contemporary looks, there are all sorts of ways to have a little fun with a few spots and stripes. This Sunday the clocks are going to be turning back an hour, meaning more light in the mornings and cozier, darker evenings. Since it’s all about the clocks this weekend, what better time to take a look at some of the beautiful and interesting clocks around at the moment? From big to small, there all sorts of lovely designs to suit your interior style. Clocks are a handy buy as they do two jobs in one; they’re the perfect decorative piece to really make a wall pop, or to add focus to a table, plus they are also a functional piece for your interior and your life! This square wall piece from Rose & Grey is the perfect unstated piece, if you’re looking for something clean and simple that will complement a relaxed design scheme, this is a great choice. The dark marble is completely on trend right now, and the square shape is an interesting alternative to the classic circle. Following the marble trend, this hexagonal light marble wall clock from Trouva is a lovely sophisticated piece. It really stands out against a dark wall, and will look equally as gorgeous in a light and airy setting, it’s a great design for a contemporary setting! A clock doesn’t just have to tell the time, it can be a creative way to bring in some artwork or a feature piece to a room. This can be achieved by getting your hands on a bold and daring wall clock. This delicate sunflower clock from Chaplins is just wonderful. The metal petals are a lovely design and despite its flower motif, its design can be used in all sorts of schemes, not just a feminine one. The design can work in both a contemporary or bohemian interior, and even be used to jazz up a traditional setting. If you love a wonderful vintage feel from your home accessories, this nautical style large wall clock from Graham & Green will do just the trick. I love the rusty, antiqued finish the clock has on it, it’ll look great up on a high wall against a pale background, or if you like a bit of organized chaos, mix it amongst some other wall pieces or art to create a wonderful cluster. For something rather special, Rockett St George are currently stocking an amazing clock designed by George Nelson in 1957. The abstract eye design is perfect if you love to decorate your home with alternative and unusual items. For something a little smaller, finding a clock for a table, be it sideboard or bedside table is a great time to experiment your style and begin to introduce a different feel to your interiors. This retro style alarm clock from Rockett St George will look fantastic in a contemporary and glamourous bedroom. The copper casing is beautiful, hopefully filling you with less dread when the alarm goes off in the morning! If you’re looking for some ultra-antique glam, this Chinoiserie clock from Oka is a great little piece. The clock is fun and playful and will look great on an antique table, or if you want to mix up your styled pair with a contemporary piece of furniture. Rowen & Wren have something up their sleeve if you’re in the market for something a little quirky and unusual. The Ellmau chalet cuckoo clock could fit perfectly into a ski lodge look, or if you want to give your room an interesting focal point, contrasting this cuckoo clock against a contemporary or minimal scheme will create an interesting effect. There is all sorts of fun to be had with picking out the perfect clock from your home, and with so much variety and choice out there you’ll have to resist the urge to put one on every wall in your house! A rather excruciating part of my job is that I am constantly surrounded by, or looking at beautiful home furnishings and accessories, that unfortunately I just cannot afford. Fortunately, the interior design world is also full of wonderful pieces and products that will only take a pinch out of your wallet, and here are ten gorgeous items all under £50.00 to get you inspired! A quick way to decorate a table area or ledge is with a few decorative candle holders. 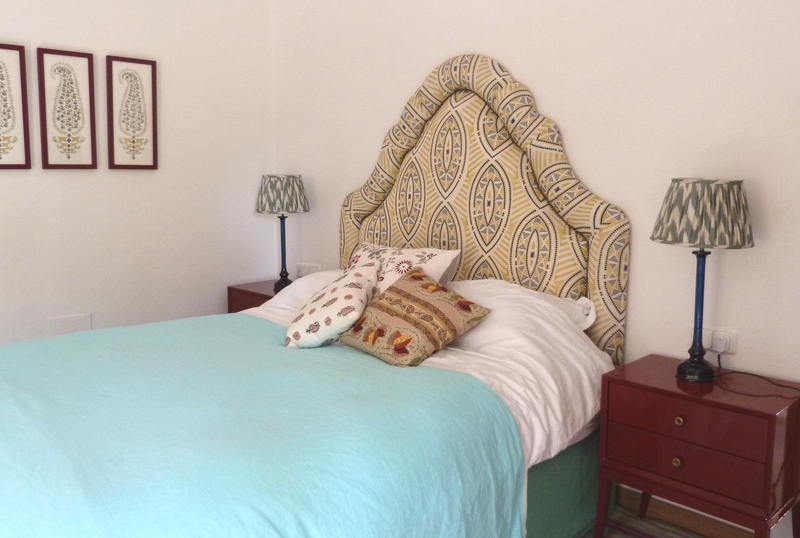 They instantly add a touch of personality to a room, and will also add a sense of homeliness. You can either follow a theme with your candle holders, or integrate a whole range of styles, from bohemian to luxe to rustic. They will easily dress up a room, and because they are usually cheap you’ll be able to get your hands of a few pairs! I love these pillar style holders from Cox & Cox, they had a hint of rustic glamour to a setting, but if you really want to give a little pizazz to a table or mantelpiece, these leopards from Oka are sure to do the trick! If you’ve bought a cheap, plain sofa there is an easy solution to make it feel fancy, and that’s cushions! There are masses of low cost cushions out there from plain, bright and patterned, but I always find that if you want to add a bit of luxury to a sofa a little texture and colour goes a long way. Sometimes you’ll luck out and the cushion pad will be included in the price, but if not you can usually get the pad for just a little extra, or if you take note of the sizing you’ll be able to find a cheaper counterpart online or in a large department store. This little minty cushion is so sweet and so stylish, and for just £25.00 including the pad it’s an absolute bargain! I love the tassels and the contrasting patterns on this Trivandrum cover from Oka, it’s a wonderful solution if your sofa is looking a little bare, and is in need of a revamp. A nice way to dress up your home is with a few flowers or plants, and for that you’ll need somewhere to put them. If you’re into your contemporary interiors, this half-moon planter may be right up your street. It’s full of character, and its copper tones will look perfect against a vibrant green plant. If you want something a bit simpler, that follows a more classic style, this glass cloche from Cox & Cox is so elegant, and just waiting for from wildflowers to be put in! When acquiring tableware, because you often need so much of it, it can be hard to find a gorgeous but inexpensive set. Instead, you might want to opt for getting some cheaper plain plates and dishes and then dressing up the table with some one-off extras. 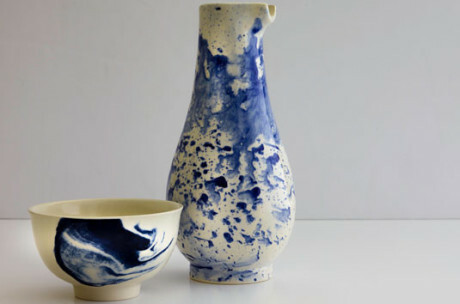 This striking jug from Trouva is amazing, and placed in the centre it’ll really stand out and make the whole table feel that extra bit special. You can easily dress up your walls without spending too much money, a nice frame added to cheap print will really increase the overall quality, and some interesting wall lighting is a great way to add some character. 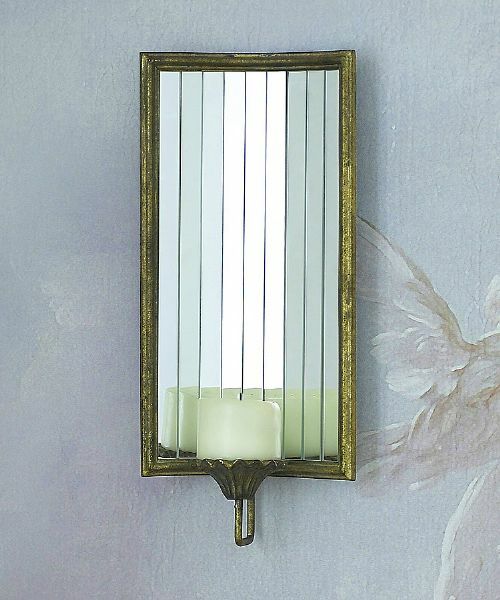 I love this candle wall sconce from An Angel at my Table, the mirror panels offer an interesting design, and it’s perfect if you love a bit of bohemian style. Decorating your home with lovely but cheaper pieces don’t just have to be about knick-knacks, you can find some wonderful pieces for a small prices that can also serve a purpose. This suitcase self from Urban Outfitters is rather sweet, and is ideal for storing books and magazines in an attractive way. It’s quirky, retro flair makes it not only useful but stylish too. When you need to add that finishing touch to a seating area, something like this little table from An Angel at my Table is a great way to insert some decorative magic. A smaller budget by no means equals scrimping on the finer things in life, or getting your hands on something that’ll really complete your home. After all, you may find that good things come with small price tags. A lot of the time when you look up at someone’s ceiling, you’re most likely to a plain white one looking back at you. Now while there is absolutely nothing wrong with a beautiful, crisp white ceiling, I always sense that in most home, the ceiling goes a little neglected. There are some wonderful ways to play around with the vast space that is your ceiling, and here a just a few ideas, from wallpaper to lighting. If you’re style tends to lean towards the more traditional side of interior design, a beautiful cornice could be just what you need. A well-crafted cornice will give your home a little grandeur and glamour. For timeless style head over to Stevensons of Norwich, they have something to suit everyone from simple to embellishment. The ceiling rose dates back to as early as the 17th Century in England, and has been a prominent feature in a lot of English homes ever since. Whether you have one that’s looking a bit crumbly, or you don’t have one at all, the addition of a ceiling rose, especially in a traditional or period home is a lovely touch that will add a bit of character to your ceilings. Stevensons of Norwich have some beautiful ceiling roses, in all sorts of styles, I particularly like the art deco designs they have in their collection. They would make a fantastic feature, either painted along with the ceiling in a dramatic colour, or if you’re feeling adventurous painted a contrasting bright colour to your walls and ceiling. Maybe you’re into a bit of bling in your interiors, and want to go full Renaissance, marble mansion-esque style but aren’t really looking to re-mortgage the house in order to kit it out. Instead of breaking the bank, why not go for a modern, playful alternative to the real thing. Wall decals are excellent ways to create a big statement in an easy, fun way. This gold stencil, available on Etsy is a great idea if you want to add a bit of neo-classical luxury to your ceilings. A great way to add a bit of colour, character and charm onto your ceilings is to wallpaper them. Whether is a bold colour or an intriguing patterns or imagery, you can begin to create your very own Sistine Chapel. For a contemporary take on the conventional cloud-like design, this wallpaper from Designers Guild is superb! Turn a bedroom or a den into a dreamy heaven with this little gem up on your ceiling! For an industrial, distressed style, this tile wallpaper is fantastic way to give your home a bit of an edge, it replicates the tin tiles that were all the rage in North America from 1890 to the 1930s. High ceilings are a blessing to those who have them, and they invite all sorts of fun and creative decorative ideas. If you have the space in an indoor room, or perhaps a conservatory, filling the ceiling area with gorgeous lanterns is great to tick the decorating and lighting boxes. Keep them all white for a sophisticated look, or create a playful environment with a range of colourful lanterns. If you like the idea of the lanterns, but maybe think they’re a little too feminine for your style, why not go for something like these black, grey and white star lanterns from Bodie & Fou. They had a cool, contemporary edge, and if you’re living in a smoky city, seeing the stars at night won’t be a problem anymore! The perfect ceiling accessory if of course a pendant light, just like a wonderful pair of earrings it’s a fab way to complete a whole look. For something rather special these tassel pendant lights from Rockett St George are a little bit magical. They’re made from smoked olive teardrop glass shades and one metre of tassels. The perfect companion for a stairwell. And lastly, for a bit of colourful fun, and a great way to quickly brighten up a room, this rainbow shade for Rockett St George will do just the trick in giving your ceiling a bit life! Whatever your style, or however brave you’re feeling just remember that your ceiling is a blank canvas just waiting to be covered in all kinds of wonderful treats!